Today is the Full Moon Day of Waso. I am sure I will look at the moon tonight if the sky is clear. 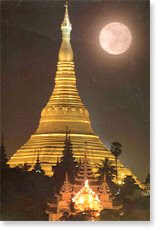 Waso, the fourth month of Myanmar calendar, marks the beginning of the lenten season. It is the time for sobriety, self-denial and religious contemplation. The full moon day of Waso month is the anniversary of the Buddha's First Sermon, at Isipatana, a sylvan woodland of Migadhaya or Deer Park. It is meet that the Buddha should deliver his first discourse in the wide open spaces where the deer can wander free and safe. It was where peace reigned and where running deer and the chasing tiger stopped in their tracks to nestle close to each other as they listened to the voice of the compassionate Buddha. The Buddha's first sermon was heard 25 centuries ago. The Four Noble Truths, namely, Suffering, the Origin of Suffering, Ceasing of Suffering, and the Path that leads to the Ceasing of Suffering. The Light of the Four Noble Truths still guides the way of enlightenment to those who are groping in the dark. Last Saturday night, my friend took me to School Concert. I was in Brunei for 3 days. I stayed in my friend's house. She was my colleague as well while I was teaching at Secondary School. Now she is teaching at Chun Hua (Brunei). Her house is cool. Jungle at the back. Mosquitoes bite me. In the evening, the monkeys came down from the trees and played on the fence. I was waiting behind the window to take pictures, but they saw me and they were scared of me. And so monkeys ran away. I felt so good that monkeys were scared of me.